18th Century, Solid Marble Bust of "The Americas"
Large, midcentury, cast bronze bust of a man mounted on a chic, veined, polished marble base of the same period. 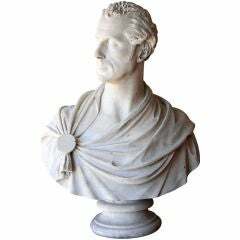 20th century marble Roman bust of a Roman military dignitary or Emperor. Made with white and Siena marble. Roman garden bust in plaster, circa 20th century.